Vigilant Vision, one of the UK’s fastest growing security equipment suppliers, has launched a unique new range of energy efficient, ultra high contrast LED monitors. Designed to meet demanding CCTV applications, these new monitors provide higher picture quality and enhanced specifications whilst delivering a 40% reduction in the total cost of ownership over the life of the equipment. The new monitors are available in 17” and 19” versions and deliver full HD picture quality with a dynamic contrast ratio of 10,000:1 for deeper contrasts and richer, more realistic colours. With a 1280 x1024 native resolution, they have a response rate of less than 5ms for easy PTZ control in busy control room environments whilst eliminating the latency that often causes fast moving images to blur or smear. The monitors offer a range of wall or desk mounting options. Energy savings of up to 46% are achieved as LED backlighting consumes considerably less power than traditional monitors. Other environmental benefits are gained during the manufacturing process by eliminating the use of hazardous substances such as mercury. The LED monitors also enable operational cost savings to be achieved as they give out less heat when in use and require less external cooling. 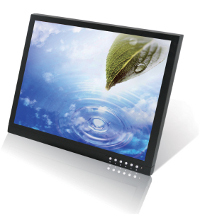 Vigilant Vision provides a unique three-year warranty for these LED monitors which are available for immediate delivery through distributors nationwide.